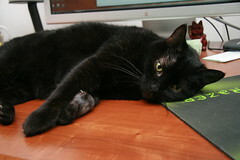 As I sit here, Ms. Kitty is lounged across my desk making it rather difficult to type. The acrylic set of fingernails I have from the wedding isn't helping much either, but we'll blame the cat. I am currently trying to decide the fate of Ms. Kitty's paw/leg. Since early January, Ms. Kitty has had a lump on her left paw. It has never caused her any concern or pain but never went away. After a few weeks I had a case of "Horrible Cat Mom" guilt and took her to the emergency vet. They did a needle aspirate and couldn't find anything conclusive, so recommended I go to my regular vet. The problem is I hated our regular vet. They were fine for normal vaccinations and earned our business by being exactly 90 seconds in the car from our house, but have never impressed me on more complicated matters. I shopped around a bit and found a new vet that I liked much better and took Ms. Kitty in for a visit a few weeks ago. They suggested a biopsy to determine the state of the lump (which, by the way, has not grown hardly at all since January). So on the 4th Ms. Kitty went in for a biopsy. The vet had said that the lump was in an awkward place amongst her paw tendons and it would be nearly impossible to remove and save the paw so as long as it wasn't cancerous we would just leave it. On the Friday before my wedding, the surgeon calls and says Ms. Kitty's paw is cancerous and his suggestion is to amputate her entire leg in the next week or two. I told him that I was getting married the next day and leaving town for a week but would call him when I got back. So today I called him and asked that if her paw was not bothering her did we need to remove it so soon? He said something like, "well if she's not using it she may as well have the leg removed" to which I explained that just that morning she was racing up and down the stairs like a crazy kitten and seemed to indeed be using all four feet, including Monster Paw (this lump has been around long enough that Rich and I have given it its own name). So he said that if it were his cat he would have it removed ASAP but that if I want to wait he understands since she has more mobility with it than he originally thought. He then suggested I could meet with an oncologist for a second opinion. I'm fine with taking Ms. Kitty's paw/arm if it will save her life and improve her health, but she hasn't seemed that upset about it so far. She's 11 years old now, and has many more years in her, but I hate to take her front leg and add more strain to her other leg if it could be another six months before she showed any signs of decreased mobility. I'm also not sure that we really need to take the whole leg if it's just her paw with the tumor. Is she really that dumb that she'll continually try to put weight on half of her remaining leg? Even if she keeps a stump she could at least continue to groom with it (maybe). Not that I mind wiping the left side of my cat's face for the rest of her life. Fibrosarcoma is "locally aggressive" but does not tend to spread all over the body. So do I wait until Monster Paw starts to cause her trouble and let her stay a quadruped for a long as possible or do we just bite the bullet and take her whole arm? Or do I insist that they leave a stump when I may possibly regret it and have them remove the rest later? All I know is her surgeon is quick to perform surgery (as most surgeons are want to do) and she's quick to race around the house on her four perfectly usable paws at the moment. Her official paperwork says that her "prognosis is guarded" and that "consultation with an oncologist may be helpful." Sigh.